Dress: Jess Lea Boutique c/o (USE CODE: HANNAH10 for discount) | Heels: Sold out similar here, here, and here | Bag: Amazon | Sunglasses: BP. I hope you had a wonderful weekend. Today I am teaming up with Jess Lea Boutique to bring you this casual chic look. I feel in love with Jess Lea Boutique when I discovered them on Instagram a while back. They had a wide range of pieces to fit any occasion. I have mentioned it many times before, but I love stripes. If I am going to go for a pattern, it will be stripes. I feel like they fit so well on any body type. 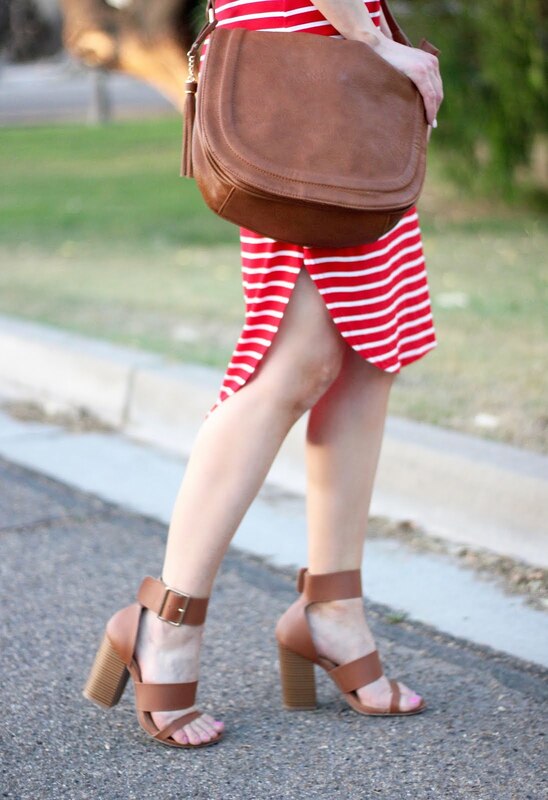 I love the red and white combo of this dress too! It's a midi length and longer in the back, so you don't have to worry about it being too short. I'm obsessed with the rounded hemline and split sides which gives the dress an ultra feminine look. And if your a classic kind of girl, it also comes in black white stripes. Memorial Day (and Fourth of July) is just around the corner and how cute would this dress be for a bbq paired with some candles or chucks. Don't forget to use code "HANNAH10" to get a special discount.